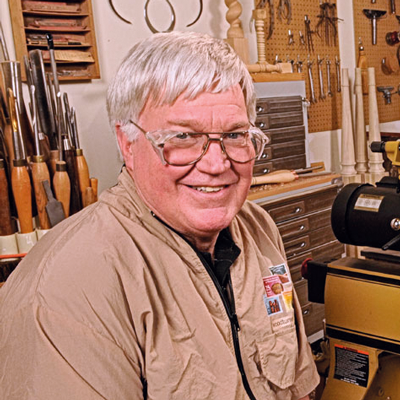 Nick Cook was one of the founders of the American Association of Woodturners and is the author of numerous articles and two popular DVDs. He is in high demand as a speaker, demonstrator and lecturer at universities, woodworking shows and seminars across USA, England, Australia and New Zealand. Nick’s work is in private collections across the world and can be seen in galleries across the USA. He delivers regular courses to groups and individuals from his studio in Georgia, USA. 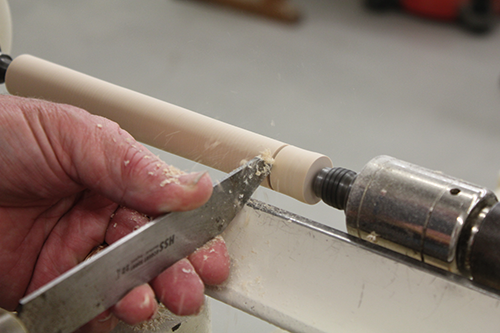 Spindle work is one of the most practical aspects to woodturning. 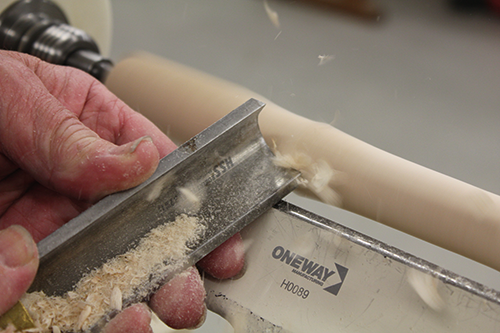 The principles of spindle turning can be picked up quickly and easily using the same techniques used to create columns, newel posts, chair legs and staircase spindles and applying them to smaller projects such as practical household implements and a multitude of gift items. 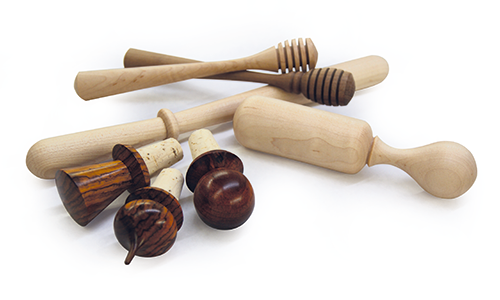 World renowned woodturner and spindle turning maestro Nick Cook introduces all his students to the joys of spindle work through these easy to pick-up projects. In fact Nick is as well known for turning gift ideas as he is for his beautiful architectural and furniture work and the numerous bowls, vases and platters that adorn collections the world over. So practised is Nick at turning practical and ornamental pieces that he has made a cottage industry out of it turning literally thousands of specific pieces to order. A variety of his work can be seen on these pages much of it made using Robert Sorby tools. Many of these items are easily achievable by novices and can be sold at craft fairs, local garden centres and interiors and home-ware stores. Christmas decorations, children’s toys, kitchen and garden implements are all within easy range of the beginner woodturner. 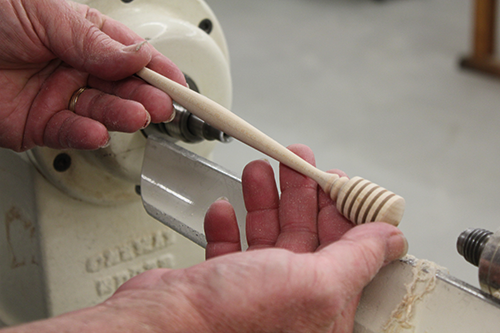 Below, Nick takes us through a very basic step approach to turning a honey dipper using a selection for Robert Sorby tools. Creating a honey dipper is a reasonably straight forward first project for the would-be spindle turner. This practical and useful kitchen utensil, widely available in craft stores is a great beginning to understanding the principle of spindle turning. Here Nick introduces a brief step guide to turning this popular project. Select stock that is clean and fee of knots, cracks and other flaws. Hard maple is a good choice but other hardwoods like cherry, ash and walnut will work well. You’re looking for material cut to 1”X 1” X 8” in length. Mark by creating a dimple at the centre of each end of the blank using an awl or punch. Using the dimples as guidance mount the timber on the lathe. Adjust the tool rest to just below the centre line and approximately 1/4” away from the corners of the blank. Always rotate the piece to ensure clearance before switching on the lathe. Roughing off. 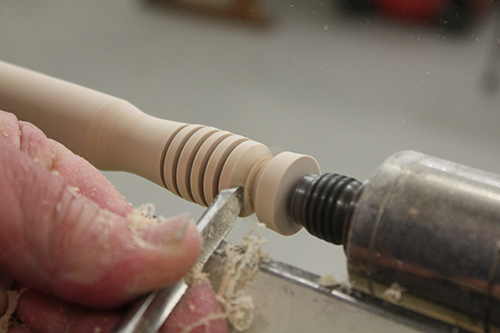 Use the Spindle Roughing Gouge to rough down the square edges of the blank to make a cylinder. 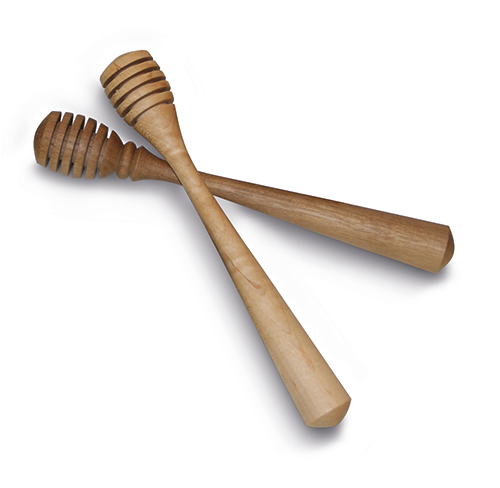 Use either a Robert Sorby Slim or Fluted Parting Tool begin to cut the grooves that will form the head of the honey dipper. The fine 1/16” cutting edge on either of these tools makes a perfect choice for cutting the grooves. 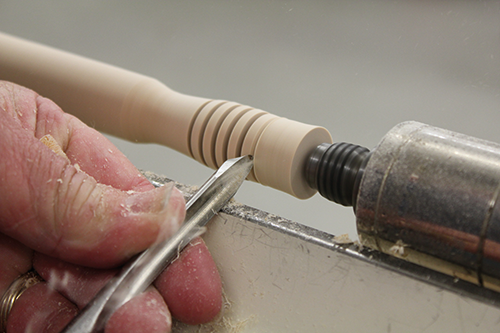 Introduce the spindle gouge to roll the beads, cutting the details on either side of the grooves. Use the roughing gouge again to shape the handle from the headstock towards the tailstock before finally detailing the head and handle using the spindle gouge once more, as seem in the picture. Sand the finished honey dipper using 150, 180 and 250 grit sandpaper. 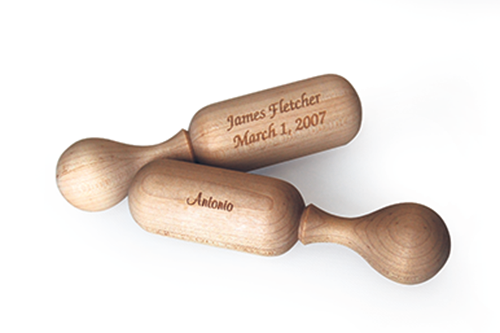 Use a paper towel to apply a finish and buff before using the spindle gouge to separate the project from the waste material. A full instructional guide to turning this and many other gift items can be seen on Nick’s DVD Turning for Fun and Profit. Visit his website.